South America: lower Paraná River basin; Uruguay River basin; coastal drainages from Rio Grande do Sul to La Plata River. A bottom dwelling Tetra that appreciates others of it's kind. Do not keep with larger predatory fish, peaceful mid-top dwellers of similar size may work well such as Hatchetfish and Danios. Will eat most kinds of food that end up on the bottom of the tank. 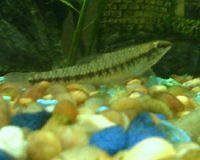 However, due to its narrow mouth it has a hard time with sinking pellets and other larger foods. Seems to enjoy bloodworms. Spends most of its time on the bottom of the tank, resting on its pectoral fins. Will occasionally hover in place by beating its fins rapidly, similar to a hummingbird. The Darter Tetra has an elongated body with black markings running down the side. They have a narrow face and pronounced pectoral fins.